Welcome back to DeaconCast. 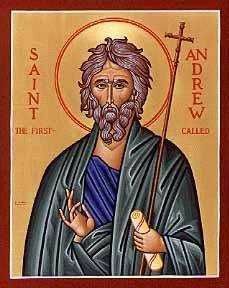 It’s Monday, November 30, the last day of the month and the Feast of St. Andrew the Apostle. Chrystostom goes on to point out that this conversion took time. Just because the scriptural narrative is fairly short, it doesn’t mean that there was overnight enlightenment. As we know from reading the rest of the Gospels, it took a long time for some of Jesus’ disciples to “get it.” In fact, for some of them it took His death and resurrection to make them understand. In the case of Thomas, it took even more than that. These early days of Advent are a good time to reflect on our own understanding of the life, death, and resurrection of our Lord. From the Catholic News Agency, the U.S. Bishops have launched a new web site for Advent and Christmas. It’s pretty neat and includes a virtual “Advent Calendar”. By clicking on each day of the Advent season you’re taken to a page of resources for that day. There are also sections of the site with prayers and blessings, Advent carols, and other cool stuff for the season. Check it out!